LOBO Advanced Platform System And Valero Energy at Pembroke Refinery. The Pembroke Refinery is an oil refinery situated on the Pembrokeshire coast in Rhoscrowther, South West Wales. It first came on stream in 1964. The refinery occupies a prominent position on the south bank of the Milford Haven Waterway and can be seen for many miles. Approximately a quarter of the site is within the Pembrokeshire Coast National Park. It was initially owned by The Regent Oil Company, a large domestic marketer of Trinidad-produced oils. The Regent Oil Company was fully acquired by Texaco in 1956 (although the brand name was only phased out in the UK in favour of Texaco in the late 1960s). Chevron acquired Texaco in 2000 and Valero Energy Corporation bought the refinery from Chevron in 2011. In August 1992, Texaco offered to purchase the entire village of Rhoscrowther, which lies immediately adjacent to the refinery. Many of the residents accepted the offer – especially after a large explosion occurred – which included their properties being purchased at market price plus reasonable expenses. Once the properties were acquired by the refinery, they were demolished. Today, five houses, a 14th-century church and an abandoned farm are all that remain of Rhoscrowther. The refinery has a fluid catalytic cracking unit that came on stream in 1982. It also has an HF Alkylation unit, a catalytic reforming unit and three hydro treating type units. Pembroke refinery has the capability of refining high Total Acid Number crude oils like Captain and Doba crudes. The purchase of the refinery in 2011, from Chevron, marked Valero’s entry in the European refining market. Opened in 1964, the refinery is one of the largest, most complex refineries in Western Europe. It makes products including gasoline, diesel fuel, kerosene, liquefied petroleum gas and petrochemical feed stocks. About 44 percent of Pembroke’s products are gasolines, including ultra-low sulphur gasoline, and about 40 percent of products are distillates. Upgrades and installation of special equipment over the years have boosted the plant’s complexity and ability to process difficult crudes, such as acidic, heavy crude. Production units require scaffolding to be erected for preventative and reactive maintenance, which has, for the last 30 years, been provided by an out sourced scaffolding company. Labour costs have risen over this time and account for a significant investment for Valero. Gareth Hughes is the site Alternative Access Coordinator, who joined Valero in June 2013 having previously worked on the site as an Asbestos removal and insulation Supervisor. This role was a completely different challenge for him. Gareth’s task was to completely review the scaffold and access requirements to see if there were any safe and suitable alternatives to traditional scaffolding. During his research, the LOBO System was identified and a sample order, together with the approved training package, was purchased. Since the LOBO System pilot order, a focus was placed on all works, excluding the very high applications. Gareth had planned to use the LOBO System for many of the jobs on routine maintenance that require working at height; it was estimated that as much as 75% of works needed a platform height of 4 metres or below. Other products or scaffolding would be used for the residual high applications. Scaffolding was always the preferred choice of access but with the discovery of the LOBO System, Valero insisted on using the best product for the job. As a result, a significant proportion of the access work is now carried out using LOBO. There can be on-going issues with traditional scaffolding which cause time delays and increase labour costs. The LOBO System, by comparison, can be assembled without the use of any tools in minutes, safely and to any shape or size and is not reliant on the scaffolding company to return and remove systems, which can increase hire costs, after the maintenance task has been completed. Sometimes the maintenance tasks only take minutes, which makes the LOBO System ideal as it can be quickly assembled, the maintenance task undertaken and then the system can be quickly dissembled. 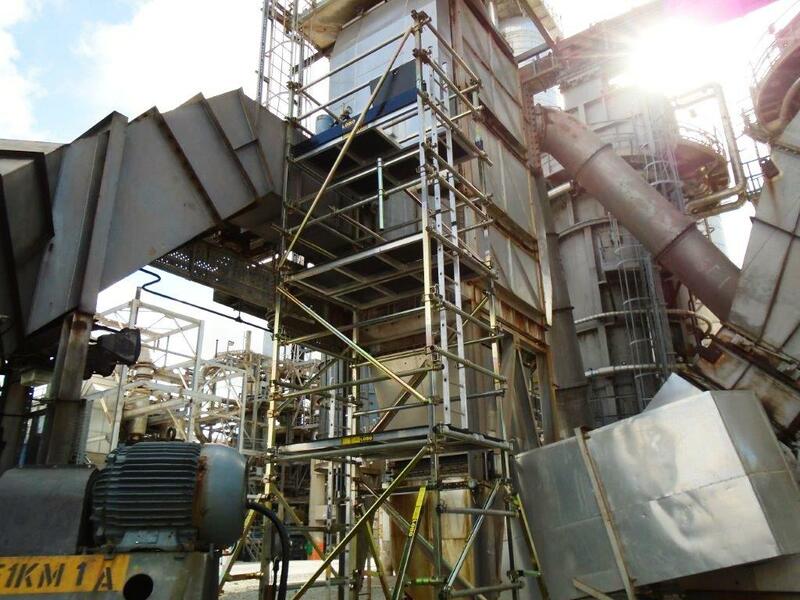 Since the pilot order, a lot of work has been carried out on major turnaround works, significantly reducing the amount and cost of scaffolding and resulting in further orders. It has been used on a range of work applications including vessel internals. Significant cost savings have been made at the refinery in terms of labour cost and also in the reduction of maintenance down time. In house maintenance crews can assemble the system quickly and safely around, under or above plant, even in restricted areas. Maintenance tasks can be better controlled and out sourced scaffolding labour costs can be significantly reduced without compromising safety.